Constantine I (306-337 AD), Constantinopolis City Commemorative, AE follis, Trier mint. 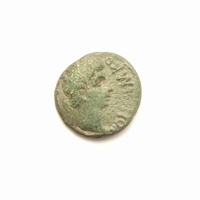 Obverse: CONSTANTINOPOLIS, laureate, helmeted and mantled bust of Constantinopolis left, holding sceptre. Reverse: No legend, Victory standing left, foot on prow, holding transverse sceptre and leaning on shield. Wreath in left field, TRS in ex. Constantine the Great and his sons issued a few different types of commemorative coins from 330-346. These were issued to mark the move of the Empire's capital from Rome to Constantinople (formerly Byzantium, but renamed after Constantine in 330 AD) and to re-affirm Rome as the traditional centre of the Empire. Thirteen mints produced these commemorative coins: Alexandria, Antioch, Arelate (Arles), Aquileia, Constantinople, Cyzicus, Heraclea, Lugdunum (Lyons), Nicomedia, Rome, Siscia, Thessalonica, Trier.